City Sanctuary has an active worship program with three bands on rotation and frequent guest bands. These bands lead worship at each church service on Sabbath (Saturday) mornings. Music starts at 11 a.m. We welcome you to come and participate in worshiping and praising our awesome God in whatever form you feel comfortable. Our bands all play from the same song list so if you come regularly, the songs will become familiar (click here to see the notes from our most recent song-selection meeting). But while the songs may be the same, the styles are HIGHLY diverse from week to week and band to band. Seaside Traverse features a modern acoustic-folk-rock style. Irving Street Band plays a lot of classics in a retro bluegrass/gospel style. Holy Hypertribe takes it to the opposite extreme with a modern electronica-folk fusion of worship songs. City Sanctuary also provides a safe place for musical artists to express themselves, sharing their own song writing, performance interpretations, and other types of performance art. 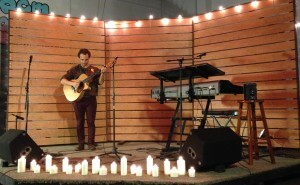 The church has a quarterly Open Artist Night and occasional concerts and other music/art events. The next Open Artist Night is February 20 at 7:30 p.m. While this program is not yet active, it is something City Sanctuary is looking to add when the right volunteers can be found.